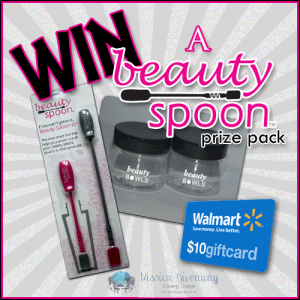 GIVEAWAY: Enter to win a Beauty Spoon Prize Pack for you and one to give to a friend (Ends 8/2/13 at 11:59 PM EST) | A Savings WOW! Grand Prize: A Beauty Spoon Prize Pack for you and one to give to a friend! Each prize pack includes(2) Beauty Spoon 2PK sets, (2) Beauty Spoon single, (8) Beauty Jars, $10 Walmart Gift Card.